NAD+ can be synthesized in humans from several different molecules (precursors), thru the De Novo and Salvage Pathways. 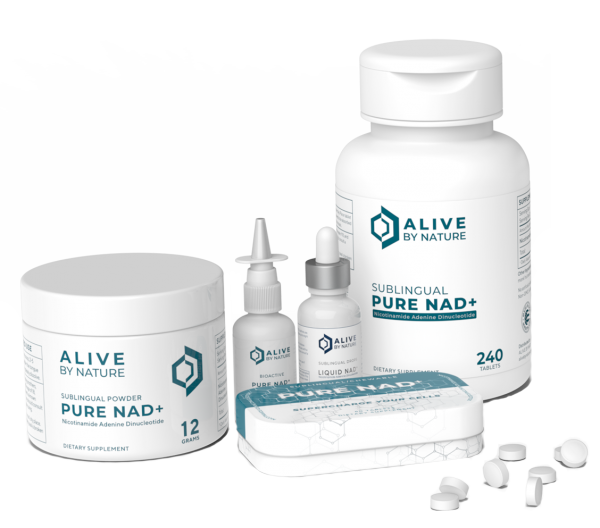 The salvage pathway sustains 85% or more of our NAD+ (14), with approximately 3g of NAM metabolized to NMN and then to NAD 2-4 times per day (14). Nampt is the rate-limiting step in the salvage process (97). 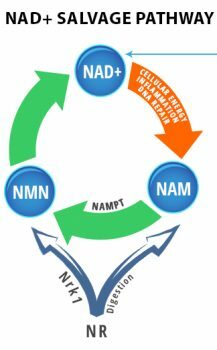 As we age, Nampt enzyme activity is lower, resulting in less NAM recycling, less NAD+, more disease and aging (97,101). 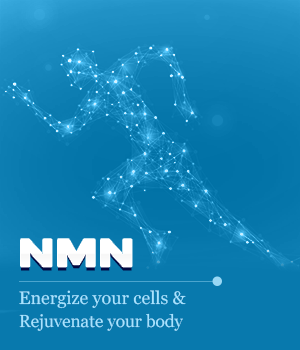 The NAD+ molecule itself is too large to make it through the digestive system intact when taken as capsules, which is why NR and NMN have been used as supplements to increase NAD+ levels in the body. 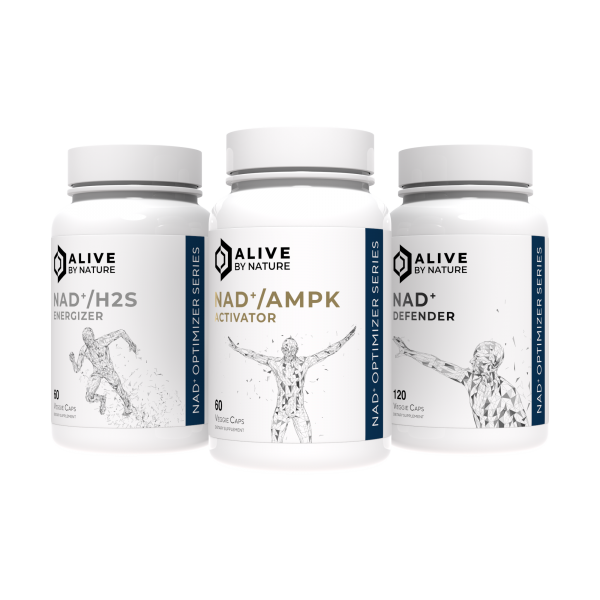 All NAD+ supplements can restore NAD+ in the Liver but does not solve NAD+ deficiency throughout the body. Providing NAD+ or its immediate precursor, NMN, directly to the bloodstream is much more effective than dropping large quantities of NAM or NR into the liver and trying to force it to produce more NMN and NAD to the bloodstream. This 2018 research showed that oral supplements of NR and NMN are digested to Nicotinamide (NAM) in the liver, with very little reaching the bloodstream (r). A study published Jan 2019 shows the newly identified Slc12a8 protein can transport NMN to NAD+ in the small intestine, avoiding digestion to NAM for a small quantity of NMN. 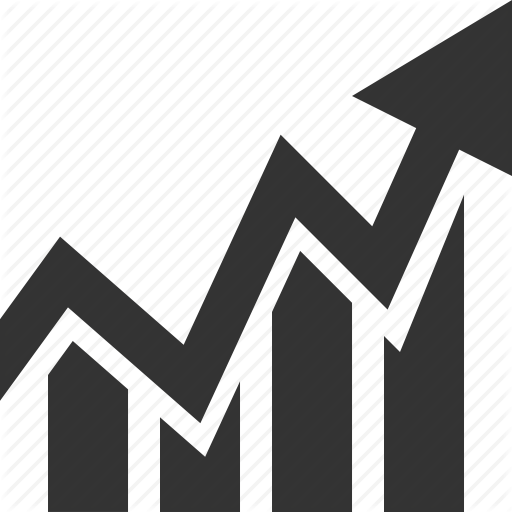 It does not quantify HOW MUCH, and the authors imply it is not a significant amount. It must also be noted that Slc12a8 transporter is most prominent in the small intestine. This NAD+ does not have a direct pathway to the rest of the body. 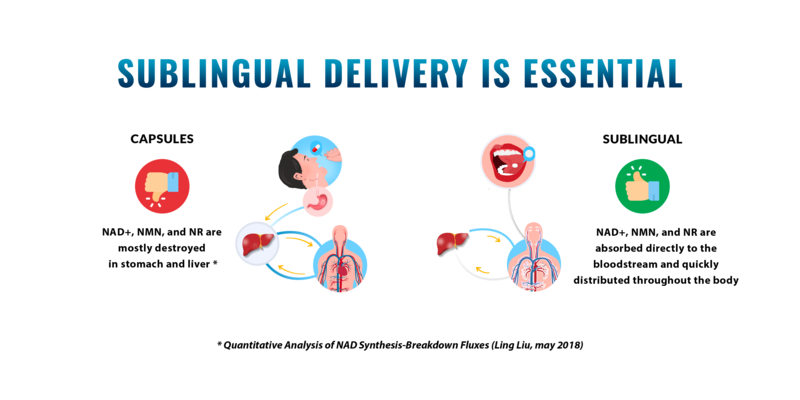 SUBLINGUAL CAN BE MORE BIOAVAILABLE THAN IP INJECTION ! This means, IP avoids the GI tract, but is still sent directly to the Liver, where much of it is converted to NAD+. Elevated NAD+ in the liver is good, but its far better to reach the bloodstream with intact NMN. Low molecular weight, low PH, hydrophilic molecules are able to easily enter the tissues under the tongue and throughout the oral mucosa where they are absorbed by capillaries into the bloodstream to quickly make their way throughout the body. We have partnered with the leading pharmaceutical sublingual products formulator to create the first NMN and NAD+ sublingual powder, tablets, liquid drops and nasal spray that have the ideal characteristics to ensure efficient and rapid uptake.